Football has always been a young man's game. That notion has never been more true than at the running back position. 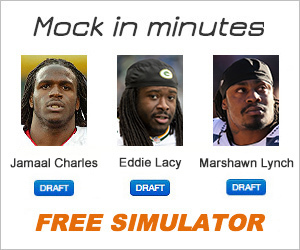 Here, we'll show you one tip when drafting a running back to enhance your team's likelihood of success. This is a simple one. Today's NFL is all about preserving the running back. Coaches and general managers now have enough data to know a running back typically lasts 4-5 years on average before seeing a drop in production. The best backs can produce into their 30's. But these are rare cases. The constant wear and tear at the position causes RB's to get injured over time. This can hurt your fantasy team because you could draft them in one of these down years. So how do you use this to your advantage in fantasy? Simple. Go young and draft a lot of running backs in the later rounds. This will help ensure you get a fresh young back who's ready to produce. It will also give you replacement options in case your back struggles or gets injured. A quick telling stat from last season. Eight of the top 10 running backs in rushing attempts in 2018 were under 24 years of age. This brings us to another point. Volume is key when it comes to running backs. You want guys who are on the field. And due to many teams opting to go with multiple starting running backs, it's getting harder and harder to find high-volume backs. In fact, a running back getting 25 carries per game is unheard of these days. The highest last season was 19 per game from Dallas Cowboys running back Ezekiel Elliott. Elliott finished with 304 carries for the year. The next closest back was New York Giants Saquon Barkley with 261. Over 40 carries less than Elliott. One other thing to note is both these running backs were under 24 years of age. Elliott is 23 and Barkley 21. These running backs were the top 2 rushers in the league in 2018. To point out how important youth is, all of the Top 7 rushers in 2018 were under 24 years of age. These include Todd Gurley (24), Joe Mixon (22), Chris Carson (24), Christian McCaffrey (22) and Derrick Henry (24). Also, in 2017, the two top rushers (Kareem Hunt and Todd Gurley) were 22 and 23 years old, respectively. 2017 was a little better for some of the older backs though. LeSean McCoy (29 years old) and Mark Ingram (28 years old) ranked in the Top in rush yards. There are always outliers. Last season Adrian Peterson eclipsed the 1,000-yard mark at 33 years old. Quite a feat. One caveat though. Peterson hadn't played more than 6 games in a season since 2015. Indicating the rest he got for three years helped him preserve his body a little. So as a general rule, it's wise to take several running backs in your draft. Have at least 3 or even 4 on your bench. Still, you should always pay attention to each individual's injury history as well. Beware of young, unproven running backs with knee issues. Plus, if you have a choice between a younger back (21-24 years old) and a slightly older back (25-27) and both running backs are getting a similar amount of carries, then best to go with the young back. Editor's note: This is a continuation of our weekly running back piece we've featured throughout this season. We've made some adjustments to this week's edition. As we now know who the good running backs are, we will focus on finding the lesser known gems with good matchups. This way, you can find running backs who have a good chance to outperform value. It's now Week 10, and the running back picture (and overall fantasy picture) is just about in clear focus. This is the time where you can start predicting value a bit more accurately, as nine games is a pretty large sample size to draw reasonable conclusions from. For example, we know Le'Veon Bell, Kareem Hunt, Todd Gurley, Jordan Howard and LeSean McCoy are legit RB1s. We don't have to tell you that anymore. However, not as many people would consider Alvin Kamara an RB1, though he's second overall in running back scoring over the last three weeks. This is in standard leagues by the way, not just points per reception. Here's a look at some very good running back options for Week 10. Why he's a decent option: The Giants veteran back is a solid RB2 candidate this week with upside. The 49ers have allowed over 90 yards to five different running backs this season, and are just coming off a 137-yard game from Adrian Peterson. Darkwa has seen his snap count increase to 32 last week, his highest total of the season. He's cracked 20+ carries only once this season, but the Giants should plan to attack the 49ers young and inexperienced run defense. It's not out of the question Darkwa cracks 20+ carries this week and nearly 100 yards rushing. Why he's a decent option: Yes, there's some risk here. But if you lost Ezekiel Elliott to suspension, this isn't a terrible matchup for the Cowboys backup RB. The Falcons defense has really struggled, allowing 25 points to the running per game. Also, as much as the Cowboys would like to pass more with Elliott out, their team is built to run the ball. The offensive line is still solid, and Morris is fresh after only seeing 14 carries this season. If the offensive line can create big holes for Morris to get downhill — watch out. The only worry will be Darren McFadden taking the passing down work, but if Dallas runs effectively than Morris should still put up decent numbers. Editor's note: This season-long series looks to find the best opportunity to score fantasy points at the running back position. It factors targets, goal line and red zone carries, and rushing attempts. This volume probability is predicated on game script, snap counts, and overall talent of the individual player. This is Week 8 of this list. You can expect more data as the season goes along and trends emerge. Also, be sure to check out our weekly rankings for complete rankings at every position for Week 8. As we head into Week 8 and the 2017 NFL season, we've seen so many weird trends occurring throughout the year. For one, Chris Thompson is an RB1 in PPR leagues. Yes, that's right. With 109 points in PPR leagues, he ranks ahead of Jordan Howard, Carlos Hyde and Devonta Freeman. That's not something we ever could've predicted heading into this year. Not to be outdone, the rookie running backs have made a huge fantasy impression as well. Kareem Hunt and Leonard Fournette rank among the top 3 RB's in fantasy points with 135 and 114 respectively. Christian McCaffrey, Dalvin Cook and Alvin Kamara all rank within the Top 20 in standard leagues, and that's also despite Cook being injured with a Torn ACL three weeks ago. The trends have certainly been interesting. Here's a list of every fantasy relevant running back for Week 8. Minnesota RB's: Since Cook's injury back in Week 4, Jerrick McKinnon has led the Vikes in snap counts each week, but Latavius Murray is creeping in. Last week, Murray surpassed McKinnon in carries for the first time all season, as the veteran back saw 18 carries for 113 yards and a touchdown. McKinnon still saw 14 carries of his own, but the trend keeps pointing up for Murray. Though their record is abysmal, the Browns have been decent against the run this season as they haven't given up more than 66 yards to an RB1. However, they haven't played many true stud backs aside from Le'Veon Bell and that was in Week 1 when Bell was still getting his feet under him after holding out in the offseason. Cleveland RB's: The Browns backfield continues to struggle as they rank 25th in rush yards per game. Neither Isaiah Crowell or Duke Johnson Jr. has rushed for more than 60 yards in a game. Johnson remains an intriguing PPR back and is coming off a six-catch game against Tennessee. Still, the Vikings have gobbled up RB's all season and they recently shutdown Buck Allen and Alex Collins last week, allowing just 50 rush yards between the two backs. Chicago RB's: The Bears have run the ball an astonishing 69 percent of the time this season and Jordan Howard's volume has been insane. Since Week 3, Howard is averaging 23 carries per game and ranks third overall in rush attempts. After seeing at least five carries in every game this season, Tarik Cohen did not record a carry in last week's win over Carolina. Game script favors more passes for Chicago this week but Howard has seen his fair share of targets as well, making Cohen a risky play. The Saints defense has really gained momentum over the past three weeks. Though Aaron Jones ran all over them last week, the Saints kept Jay Ajayi, Jonathan Stewart and Ameer Abdullah all in check. New Orleans RB's: This backfield has been a fun one to watch and could get better as the season goes along. With Adrian Peterson out of the picture, Mark Ingram has had back-to-back 100-yard efforts and three touchdowns to go along with 9 catches for 41 yards. He has RB1 potential every week and is an underrated receiver. Rookie Alvin Kamara has been lethal in the passing game, catching for 19 passes over the last three games and he's getting the volume as his 39 targets ranks second on the team behind Michael Thomas. Drew Brees has thrown for multiple touchdowns in each home game this season, giving Kamara some potential scoring value. The Bears have been decent against the run, but rookie Mitchell Tribusky's growing pains has stifled their offensive output, meaning there will be added pressure on them this week. Atlanta RB's: The Falcons have been reeling with three straight losses and this is the perfect rebound game for them. Devonta Freeman hasn't scored a touchdown since Week 4, but he's out-targeted Tevin Coleman 7-2 over the last two games. He's also outsnapped Coleman by at least 20 snaps each week since Week 4. There's a good chance Freeman sees 15-20 carries this week. The Jets have been decent against the run this season, allowing just one rushing touchdown over their last five games. Still, Atlanta is a better team than they've shown and had plenty of chances to score against New England last week but failed to finish drives. Freeman has great RB1 potential here. N.Y. Jets RB's: The combination of Matt Forte, Bilal Powell and Elijah McGuire is an atom bomb to fantasy point potential. With Forte and Powell both healthy, the snap count has been close to an even split and neither running back rushed for more than 43 yards last week. The Falcons have struggled against the run as of late, giving up 130 yards to Jay Ajayi in Week 6 and over 150 to the New England backfield last week. Still, Powell and Forte are being used too evenly to warrant any more than flex value. Carolina RB's: Christian McCaffrey remains the favorite back but his inability between the tackles is all too real. The rookie is averaging a meager 2.5 yards per carry but he's still an RB19 thanks to 329 receiving yards, which ranks second among running backs behind Chris Thompson. Jonathan Stewart has 99 carries without a rushing touchdown, only Jay Ajayi has more attempts without a score. This is a plus matchup for Stewart though, as the Bucs allowed a 100+ game from Adrian Peterson last week and a 91-yard performance from LeSean McCoy. Not a crazy idea to start Stewart at the flex spot. Tampa Bay RB's: Doug Martin cracked 20 carries for the first time last week and although it was his worst fantasy day of the year, it's still promising to see him in a prominent role. Carolina has been very good against the run this year as they have yet to allow a 100-yard rusher, but Martin should still provide value for fantasy owners given his workload. Charles Sims was an intriguing PPR option, but his targets have decreased over the last three games. He's not fantasy relevant as of now. San Francisco RB's: The 49ers rush attack looks like its back to normal with Carlos Hyde dominating the snap count 107-32 over the last two weeks. Hyde also saw a season-high eight targets last week against Dallas, which came mostly due to San Francisco trailing Dallas by a wide margin. That could be the gamescript again this week, as there's arguably no team in football hotter than Philadelphia right now. On the flip side, Philadelphia has been stout against the run this season, but they have been gashed by receiving backs. They surrendered 10 catches to Christian McCaffrey two weeks ago and allowed a touchdown to Chris Thompson last week. Their line backing core is also banged up, so they might be easier to run on this week. Philadelphia RB's: The 49ers have easily been the worst run defense in the NFL over the last two seasons. This is great for LeGarrette Blount owners. The 49ers surrendered a monster game to Ezekiel Elliott last week, allowing over 140 rush yards and two scores to go along with one 72-yard receiving touchdown. Blount hasn't had a true monster fantasy effort yet, but he's cracked 100+ yards before and could be the clock control guy if Philly gets a lead early. He's an RB1 guy this week. Wendall Smallwood also has darkhorse intrigue as a flex due to his similar snap count to Blount. Oakland RB's: Marshawn Lynch is out, but Jalen Richard and DeAndre Washington have been seeing an even snap count which limits their fantasy value. The Bills are very good against the run, allowing just 19 points to fantasy running backs per game. Both Washington and Richard have been used equally in the passing game as well. Both are risky plays this week. Buffalo RB's: The Raiders have struggled against the run, allowing a rushing touchdown in two of the last three games. Though they haven't allowed a 100-yard rusher this season, four running backs have finished with 73 or more yards. It's likely LeSean McCoy comes close to becoming that first 100-yard rusher. Shady has seen at least 19 carries in the last three straight games and is averaging close to seven targets per game. This is a solid matchup for him. Indianapolis RB's: Things are trending up for Marlon Mack. Last week, the rookie saw more snaps than fellow veteran back Frank Gore for the first time this season. While Mack only saw five carries, which were four less than Gore, he made up for it with four catches for 40 yards on six targets. While this game might not be a shootout, Mack has potential to be a decent flex/RB2 option as his role continues to expand. Cincinnati RB's: Joe Mixon and Giovani Bernard continue to split snaps, making this a tough backfield to rely on. Still, Mixon has improved from Weeks 5-7, averaging 4.5 yards per carry in his last two games. The Colts are atrocious against the run, allowing 27.5 points to running backs. Mixon could creep into the RB1 picture this week, even though it's still a long shot. Los Angeles RB's: Melvin Gordon is coming off a down week against a tough Denver defense. The last time he performed that poorly was against the Philadelphia Eagles in Week 4. Both defenses rank among the top in rushing yards allowed, so this bodes well for the possibility of bounce back performance from Gordon. The Chargers are surging with three straight wins and this could be a shootout game. Gordon is averaging about 21 carries per game over the last three weeks and is averaging eight targets per game. The Patriots held the Falcons in check last week scoring-wise, but they still gave up 72 rush yards to Devonta Freeman on just 12 carries. Gordon could be in for a big week. New England RB's: The Patriots backfield is messy, like REAL messy. Last week, three running backs saw 20+ snaps and two more seeing more than 10. That was also the same case in Week 5. Still, there's some minor fantasy value to be had. Dion Lewis is currently the leader in carries over the last few weeks with 24. James White continues to be the passing game with seven targets per game over the last three weeks, and Mike Gillislee is still getting some of the goal line work. Basically, the Pats have a back for every possible scenario, making it very difficult to predict which one will pop. Right now, Lewis is your best bet. The Chargers are a middle-of-the-road rush defense, allowing 23 points per game to running backs. Houston RB's: DOnta Foreman crept back into the picture last week, seeing 12 carries to starter Lamar Miller's 15. The Seahawks are a very good run defense, allowing just 19 points to the running back this season. This is a matchup to stay away from unless you have to start Miller. Seattle RB's: With Chris Carson out for the year, this is still a very confusing backfield. Eddie Lacy and Thomas Rawls both saw 11 carries last week, with J.D. McKissic seeing a small role in the passing game. Houston's run defense is even better than Seattle's right now, allowing just 17 points per game to the running back. Stay away from this backfield this week. Dallas RB's: Ezekiel Elliott's 40-point fantasy performance last week was the second highest of the year next to Kareem Hunt's massive 42-point outburst in Week 1. Elliott and the Cowboys need to keep pace with the Eagles, so this is a big game for them. Expect Elliott to see 20-25 carries and inch close to 100-yards. The Redskins have been decent against the run, but they've surrendered 100-yard games to stud RB1's, most notably Kareem Hunt in Week 4. Washington RB's: Chris Thompson remains the reliable fantasy back for Washington, as he's registered at least 100 receiving yards or a touchdown in all but one game this season. He's an RB7 overall in PPR leagues and one of the biggest surprises this season. The Cowboys have been weak against the run overall this season, allowing three 100-yard games to RB1's. Don't be surprised if Samaje Perine has a decent day against this rush defense as well. The only issue is the Redskins offensive line, which is currently banged up with Brandon Scherff gone and Trent Williams battling a knee injury. Pittsburgh RB's: Le'Veon Bell has cracked 30+ carries in three out of the last four games this season, and has over 100 yards in each of those games. Pittsburgh has also won each game where Bell sees 30+ carries, meaning there's a vested interest in getting him the ball that much. Bell is locked in as an RB1 this week, and gets a plus matchup against a Detroit defense allowing over 25 points each week to running backs. Detroit RB's: Ameer Abdullah and Theo Riddick saw similar snap counts last week, with Riddick seeing the passing down work in the form of seven targets to Abdullah's two. While Adbullah is getting the most carries, he's only cracked 20+ once this season. Although the Steelers were dismantled by Leonard Fournette and Jordan Howard, their defense is starting to find its rhythm. They held Kareem Hunt to a season-low 21 rush yards and Joe Mixon to 48 yards last week. This is a backfield to avoid in Week 8. Denver RB's: C.J. Anderson is still the clear top back in terms of snap count, as the vet saw a team-high 38 snaps in the last two weeks. Still, the Broncos have really struggled to run the ball. They haven't had a 100-yard rushing effort from one back since Week 2 when Anderson ran for 118 yards against Dallas. The Chiefs are coming off two straight losses and are due for a rebound game at home. They've only allowed one 100-yard effort so far and that was Le'Veon Bell in a loss two weeks ago. Avoid this backfield if you can in Week 8. Kansas City RB's: Kareem Hunt has tapered off a bit as of late, but he's still locked in as an RB1 despite a tough matchup. Aside from a puzzling week where they allowed over 110 rush yards to Orleans Darwka of the Giants, Denver has been lights out in the run game. They're allowing just 15 points to fantasy backs per game this season, which is best in the league. Hunt is still getting enough volume to be good in redraft and PPR leagues, but this could be one of his less productive fantasy games. This is Week 6 of this list. You can expect more data as the season goes along and trends emerge. Also, be sure to check out our weekly rankings for complete rankings at every position for Week 6. As we head into Week 6 and the 2017 NFL season, the fantasy running back picture becomes more and more clear. Backs like Leonard Fournette, Todd Gurley, Melvin Gordon, Devonta Freeman, Le'Veon Bell have all established themselves as clear RB1's. This is also the time of year when injuries crop up and younger backs get their chance. We saw that with Aaron Jones in Green Bay, Elijah McGuire in New York and Matt Breida in San Francisco. This is the time where managing your waiver wire is crucial, as the changing of the guard between starters and second-string running backs can often lead to a new fantasy front runner for the remainder of the season. Here's every fantasy relevant running back for Week 6. Cleveland RB's: Over the past two weeks, Duke Johnson has more fantasy points (26) than Kareem Hunt (24). The Houston Texans are still a strong defense, even without JJ Watt, but Johnson's versatility keeps him on the RB1 radar this week. While Johnson saw just three targets last week, he turned them into three catches for 63 yards and a score. The Browns are switching quarterbacks, starting Kevin Hogan in replacement of DeShone Kizer. Hogan is a game manager quarterback, which could lead to more check-down throws to Johnson especially with Houston's pass rush forcing his hand. Last week, Isaiah Crowell saw his biggest volume total since Week 1 with 16 carries, but Houston's defense is only allowing 21 points to running backs this year. Best to throw Johnson in as a flex option and bench Crowell. Houston RB's: Lamar Miller has completely dominated the snap count as of late and is benefiting from a white-hot Deshaun Watson. Over the past two games, Miller saw nine looks in the red zone and is averaging 75 rush yards per game. He's not a prolific receiver at the RB spot, but he's averaging close to three targets per game. If Houston jumps out to an early lead, this could be a game where Miller cracks 20 carries. The Browns have been a very good run defense, not allowing a running back to rush for over 70 yards all season. Miller has some appeal because of volume, but that's about it. He hasn't established himself as a big play back, with just 52 yards coming on runs of 15 yards or more. New England RB's: The New England running back narrative of 'you can't trust anybody' was dashed last season with LeGarrette Blount's 18 scores. But this season it looks like it's difficult to trust anybody. Last week, four Patriot running backs saw 13+ snaps. Dion Lewis saw a season-high seven carries, which took away some of Mike Gillislee's value. The one constant seems to be James White in the passing game. White has 21 targets in the last two games and 17 catches total. The Jets have struggled against the run overall, but have bottled up top backs Jay Ajayi and Leonard Fournette. Gillislee is a risky start in that regard and Lewis should see more snaps going forward. New York Jets RB's: Matt Forte returns this week, Bilal Powell is likely sidelined and Elijah McGuire should see time as the second back. The matchup is a great one, with New England giving up a league-worst 38 points per game to running backs. This game has sneaky shootout potential, and both backs have dark horse RB1 upside due to their versatility in the pass game. Miami RB's: It's been a rough start for Jay Ajayi, who's yet to score a touchdown despite 76 carries. Only LeSean McCoy and Jonathan Stewart have more carries without a touchdown. Ajay's offensive line hasn't helped much, as the Dolphins rank in the bottom 6 in yards blocked per contact according to Pro Football Focus. The Falcons have been solid against the run this season, not allowing a 100-yard rusher. They've been weak against pass-catching backs though, giving up at least three catches to every RB1 this season. Ajayi isn't a prolific receiver, but he could find himself getting more receiving yards in this one. He's still an RB1 given his high volume of carries per game. Atlanta RB's: The Falcons come off the bye week at home where they will face one of the toughest run defenses in the league. The Dolphins have only allowed one running back to crack 50+ yards and that was DeMarco Murray last week. Expect Atlanta to favor the pass in this one, which could make Tevin Coleman the better back to go with. Coleman is averaging close to five targets per game and the Falcons receiving core is banged up. Mohamed Sanu is out and Miami will devote a lot of attention to Julio Jones. Detroit RB's: The Detroit backfield remains dicey with three running backs getting valuable snaps. Ameer Abdullah is the clear No. 1 in terms of carries, but Theo Riddick continues to see plenty of targets and Zach Zenner is also getting looks in the red zone. New Orleans has been solid against the run this season, only allowing one 100-yard rusher and that was back in Week 1. They've been vulnerable to pass-catching backs though, as they were gashed by Christian McCaffrey and James White 17 catches and 186 yards combined. The game script in this game favors Riddick among all Detroit backs. New Orleans RB's: it will be New Orleans first game without Adrian Peterson, who was traded to the Arizona Cardinals earlier this week. This is great news for Mark Ingram owners, as Peterson was taking away about seven carries per game from Marky Mark. Ingram saw a season-high 46 snaps last week and that number could creep into the 50's with Peterson gone. Expect anywhere from 15-to-20 carries this week for Ingram. Alvin Kamara has been one of the most prolific rookie pass catchers this season with 26 grabs so far. Only Christian McCaffrey and Tarik Cohen have more. The Lions have been decent against the run this season, only giving up one 100-yard game this season. Still, New Orleans is a different team at home and should fare well in potentially high-scoring game. Green Bay RB's: Ty Montgomery practiced this week and is listed as 'questionable.' He'll have his work cut out for him against a Minnesota defense that's one of the best against the run. The Vikings have held Jordan Howard, Mark Ingram and Le'Veon Bell all in check this season, and this could be a game where passing ends up being the way to go for Green Bay. Aaron Jones was fantastic in replacement of Montgomery last week, rushing for 125 yards and score. Obviously, his value is curbed if Montgomery plays. Both runners are risky options given the strength of Minnesota's defense. Minnesota RB's: Jerick McKinnon was dominant last Monday against Chicago, and might be the lead back going forward after out-snapping Latavius Murray 47-to-22. McKinnon was also very efficient in the pass game, catching all six of his targets for 51 yards. Murray struggled to gain yards after contact and finished with just 31 yards on 12 carries. The Packers struggled against Ezekiel Elliott last week, but they've been a solid run defense overall. Still, McKinnon's versatility and volume gives him RB1 potential each week. Chicago RB's: Jordan Howard has reasserted himself as the team's lead back after Tarik Cohen's hot start lead many to believe this would be a split backfield. Howard fared well on Monday night against a tough Vikings defense, rushing for 76 yards on 19 carries. He gets another test this week against a Baltimore group that held Leonard Fournette to just 59 yards and completely shutdown Marshawn Lynch last week. Howard is an RB1 in redraft given his volume and role as an every-down back. Baltimore RB's: The Bears have given up a rushing touchdown to every RB1 they've faced this season. This is good news for Javorius Allen, who's coming off a solid outing against Oakland where rushed for 73 yards and a score while catching four of five targets. Allen is a solid RB2 with RB1 upside in this one. Expect Alex Collins to be in the mix as well, as he saw 12 carries last week and nine in each of the past two games. Still, Collins upside is limited since he doesn't see many targets. San Francisco RB's: After a solid start where he rushed for over 250 yards in his first three games, Carlos Hyde is starting to see less usage in San Francisco. He saw just eight carries against Indianapolis while backup Matt Breida had 10 and looked much more efficient with 49 rush yards. Washington has become very good defense overall this season. Against the run, they're giving up just 22 points per game to running backs. Perhaps even more impressive is the Redskins have put up those numbers after facing both Kareem Hunt and Todd Gurley this season. This is a tough week to start any San Francisco running back. Washington RB's: The Washington offensive line has been a Top 5 unit this season, getting 2.26 yards of contact blocked according to Pro Football Focus. It's just too bad they haven't found a clear lead running back to make the most of those yards. Rookie Samaje Perine hasn't rushed for more than 67 yards despite two games of 19+ carries. Rob Kelley haven't rushed for more than 78 yards and he's struggled to stay healthy this season. Speaking of his health, Kelley likely won't play this week as he's listed as doubtful with a ankle injury. San Francisco isn't as bad a run defense as they were last season thanks to some promising rookie play for DeForest Buckner. Still, they're giving up over 35 points to the running back position this year. Perine is risky but there is some upside to this matchup. Los Angeles Rams RB's: Todd Gurley is coming off his worst performance of the year, rushing for 43 yards on 14 carries against Seattle. He should be in for a bounce back game against a Jacksonville defense that's giving up 30 points per game to running backs. The Jaguars are a bit of a Jekyll and Hyde team this year. They gave up 250+ yards to Bilal Powell and Elijah McGuire, then they held Le'Veon Bell to just 47 yards and DeMarco Murray to just 25 yards. Expect Gurley to have be better than last week, but this Jaguars team might be sneaky good. They seem to get up for the big-name backs and Gurley is a big name. Jacksonville RB's: The Jaguars are living up to the identity of a run-first team. Leonard Fournette is the league leader in carries with 109. His five touchdowns are tied with Devonta Freeman for the most in the league. The Rams are giving up 35 points per game to running backs this season, but have been better in recent weeks after holding Seattle's backfield to just 39 rush yards. Still, this is a great matchup for Fournette and his volume makes him one of the most reliable rushers so far this season. Tampa Bay RB's: Doug Martin burst back onto the scene following his four game suspension, finishing as an RB7 with 74 yards and a touchdown against a struggling Patriots defense. He'll get a tougher test against the Arizona Cardinals this week, a team that hasn't allowed a 100-yard rusher and has only surrendered two rushing touchdowns this season. Still, the Cardinals offense has struggled to score points which wears on a defense as the season goes along. The Cardinals rank 26th in points per game and will have to hope Adrian Peterson breathes some life into one of the worst rushing offenses in the league. If they continue to struggle on offense, it means a more favorable game script for Martin. Arizona RB's: Peterson will get his first start against a Tampa Bay defense that's giving up 30 points per game to running backs. It's difficult to say how he'll fare, especially since Tampa Bay has struggled more against passing backs than every-down rushers. The Bucs have given up at least five catches to pass-catching backs in three of their four games, making this a solid matchup for Arizona's Andre Ellington. Ellington has 24 targets over the last two games and the Cardinals will continue to pass due to injuries on their offensive line. Pittsburgh RB's: Le'Veon Bell saw a season-high 73 snaps last week to go along with 10 catches on 10 targets. There isn't a back in the league with more opportunity than Bell right now, and Pittsburgh will lean on him once again to take down an undefeated Kansas City team. Kansas City is giving up only 23.4 points per game to running backs this season, so this could be a tougher matchup for Bell. But of course, you're starting him each week barring injury. Kansas City RB's: Kareem Hunt rushed for over 100 yards in his third straight game last week, but Charcandrick West sniped two receiving touchdowns from him. Still, you shouldn't worry much if you have Hunt, as he'll see plenty of volume against a Pittsburgh defense that's sneaky bad against the run. The Steelers have gotten smoked by RB1's so far this year, giving up 100+ yards to Jordan Howard, Leonard Fournette. Both running backs also had multiple touchdowns in those games. Hunt is a great play this week in all formats. Los Angeles Chargers RB's: Melvin Gordon is coming off his best performance of the season against the Giants, where he rushed for over 100 yards and had two receiving touchdowns. His 65 snaps were also a season-high for him that season. The Raiders are average against the run and this should be another solid game for the third-year running back. Oakland RB's: Marshawn Lynch's status as an RB1 might be over if he can't dominate this matchup. The Chargers have allowed three running backs to rush for over 100 yards against them so far this season. They've also given up over 100 yards to every backfield they've faced this year. Jalen Richard is also a good sneaky play in deeper leagues as he only saw two less snaps and three less carries than Lynch. New York Giants RB's: Wayne Gallman looks like the best option for New York at this point. But this is a terrible matchup for New York and injuries at the wide receiver position will likely cost them in the run game. The Broncos have shut down RB1's this season and they've faced some studs, some of which include LeSean McCoy and Ezekiel Elliott. Denver RB's: C.J. Anderson is the clear No. 1 back in this offense and has seen three games of 20+ carries. The Giants have given up at least 80 yards to every RB1 they've faced this season, and game script could help Anderson's cause if New York can't score. Jamaal Charles is a sneaky good start as well if Denver jumps out to a big halftime lead. This is Week 5 of this list. You can expect more data as the season goes along and trends emerge. Also, be sure to check out our weekly rankings for complete rankings at every position for Week 5. Each of the top six running backs from Week 4 had at least four receptions. That should tell you all you need to know about the hybrid running back's potency in fantasy football. It was also a quiet week scoring wise, with only Le'Veon Bell rushing for more than one touchdown. With the exception of Green Bay and Dallas, we could be seeing low numbers once again in Week 5 as high-powered offenses such as Atlanta, New Orleans, and Washington are on a bye. Here's a look at every fantasy relevant running back for Week 5. Los Angeles Chargers RB's: Knee problems continue to bother Melvin Gordon despite him seeing the highest volume of any Charger running back. Gordon finished as an RB49 in Week 4 and his reduced role in the receiving game has been a big part of that. In the first two weeks, Gordon caught 12 passes for 90 yards. He has just one catch for seven yards since. The matchup is a good one though, as the Giants are giving up 23 points to running backs per game. Still, Gordon is risky at best due to injuries. Branden Oliver is not startable at this time. New York Giants RB's: Wayne Gallman popped onto the fantasy radar in his first performance, going for 42 yards on 11 carries and a touchdown reception. His 31 snaps led all players and he was the best back, but Paul Perkins and Shane Vereen still saw 14 carries between them. It's tough to start Gallman, but it's encouraging that the Giants are working him in more. The matchup is also a fantastic one, as the Chargers have given up over 100 yards to three running backs in three weeks. Gallman's ceiling is curbed, but he's not a terrible darkhorse option in really 14-16+ leagues this week. Buffalo RB's: LeSean McCoy has been good volume consistently but he hasn't made the most of it so far. Through four weeks, he's finished as an RB5, RB37, RB33, and RB21 with zero rushing touchdowns. Not exactly top numbers for a player drafted in the late first/early second round in most leagues. The Bengals are tough against the run, giving up 20.5 fantasy points per game. It's best to keep starting McCoy in standard leagues and PPR leagues because of his volume, but he's worth fading this week in Daily Fantasy. Cincinnati RB's: Joe Mixon continues to play well, but his offensive line is hurting him. Per Pro Football Focus, the Bengals rank dead last in yards blocked per contact at 1.31. The Bills are a solid run defense, giving up 20 fantasy points per game at the position and haven't allowed a 100-rusher yet. While he has some variables going against him, Mixon still isn't a bad play given his opportunity. He's carried the ball 35 times over the last two games and has the most targets (7) for Bengals running backs over the last two weeks. He's slowly becoming the bellcow back. New York Jets RB's: Bilal Powell and Elijah McGuire combined for over 250 yards and two scores last week. Powell now has a score in each of his last two games and is averaging RB1 numbers. Last week, Powell's five targets tied for second most among all Jets and his 21 carries were a season high. With Matt Forte still out, Powell and McGuire are the top two backs in New York going forward. The Browns are average against the run, making this matchup a decent one. Cleveland RB's: Incoming Duke Johnson Jr. The third-year running back out-snapped Isaiah Crowell for 36-22 last week, by far his largest separation from Crowell. While Crowell had more touches, Johnson still only had three less carries and his 9 catches for 47 yards make his ceiling very high going forward. Johnson should also have plenty of favorable game scripts for receiving backs, as the Browns defense is one of the worst in the league vs. quarterbacks. The Browns have given up 31 points in each of the last two games, which should help Johnson get more yards in the second half as the Browns play catch up. Jacksonville RB's: In one of the potentially higher scoring games this week, rookie Leonard Fournette is once again center stage. The former LSU star continues to get better as the season goes along. He finished with a season-high four catches for 59 yards and a touchdown last week and has led all Jacksonville running backs in targets every week. His 81 total carries ranks third behind Todd Gurley and Le'Veon Bell. Pittsburgh's Ben Roethlisberger tends to play better at home, so the gamescript might not lend itself to as much rushing volume for Fournette. Still, Pittsburgh hasn't been great against the run after allowing Jordan Howard and Alex Collins to rush for a combined 220 yards over the last two weeks. Fournette is a no-brainer RB1. Pittsburgh RB's: This is another dream matchup for Le'Veon Bell. The Jaguars have given up over 100 yards to running backs in three of the last four games. Pittsburgh's offensive line ranks ninth in yards blocked per contact with 2.06. Bell's 87 rush attempts leads the league and he, Todd Gurley and LeSean McCoy lead all bellcow backs with 22 targets. The one worry for Bell could be gamescript in this one, as the Steelers might get out to a quick lead and fail to throw Bell's way for the touchdown. That's just a risk you have to take. Tennessee RB's: Miami hasn't allowed a single running back to rush for more than 45 yards this season. They have been susceptible to pass-catching backs though, giving up 10 catches to Alvin Kamara last week and seven to Melvin Gordon in Week 1. The Jets RB's were the only group they held in check, but that was likely due to gamesflow that allowed all three Jets running backs to play conservative and simply waste clock. Only six fantasy points separates DeMarco Murray from Derrick Henry through four weeks. Aside from a monster Week 3 performance where he finished as an RB8, Murray has only 101 rush yards combined in the other three games. Henry hasn't fared much better, with his best performance coming in Week 2 with an RB9 finish. Both backs are risky in this matchup. Miami RB's: Jay Ajayi hasn't finished higher than RB12 since Week 2 and is currently nursing a knee injury. The Miami offensive line also ranks in the bottom 6 in yards blocked per contact, per Pro Football Focus. Tennessee is giving up 25 points to running backs, so there's so upside to the matchup for Ajayi. Still, he's risky given his health and although he's a tough player, it's best to fade him in Daily Fantasy and only start him in redraft. San Francisco RB's: With two RB1 finishes through four weeks, Carlos Hyde has been a great value so far in redraft and PPR leagues. He has hybrid potential each week, averaging near six targets per game. His 65 carries rank 12th highest among running backs and he has a plus matchup against a Colts rushing defense that's allowed 25 points to running backs this season. No other running back in San Francisco is startable at this point. Indianapolis RB's: Marlon Mack is back. It's the return of the Mack. Sorry, had to. Indy remains a run-oriented team with Andrew Luck still out, as they've opted to pass just 52 percent of the time which ranks 27th overall. Frank Gore has two RB2 finishes through four weeks, but he hasn't been very effective with just 3.1 yards per carry on 61 attempts. It's likely the Colts could try and use Mack more, but Gore is still the feature back going forward until Mack makes the most of his opportunity. In the two games he played, Mack finished with just 27 total rushing yards. Arizona RB's: Chris Johnson is the higher volume running back in terms of rush yards, but Andre Ellington is the most fantasy potent. Ellington's caught 14 passes for 145 yards on 22 targets over the last two weeks. Those numbers helped him rank 15th in PPR leagues, making him a boarderline RB1 in that format. Ellington is startable due to his role in the passing game, though Philadelphia has been solid against the run, giving up only 19.3 points per game. Philadelphia RB's: The Eagles have really gotten their run game going over the last few weeks. LeGarrette Blount has posted RB1 numbers in both weeks, totaling 203 yards and a score despite seeing less snaps than fellow back Wendell Smallwood. Speaking of Smallwood, he's averaged out to be a solid RB2 option over the last two weeks in both standard league and PPR leagues. The Cardinals run defense is one of their strongest areas, so this will be a test for Philadelphia. Still, they're run game is in sync right now and should still produce decent fantasy numbers. Detroit RB's: Ameer Abdullah recorded his first RB1 finish last week, ranking 9th among all running backs in fantasy points with 17. His volume has been solid, as his 66 carries rank him 19th overall among RB's. He's starting to distance himself from Theo Riddick in the snap count, but Zach Zenner is also in the mix and could steal goal line touches. The Panthers have been solid in the run defense department, but they've given up 35 catches to running backs over a four game span. Abdullah could be in for a decent outing if he sees the most targets among Detroit running backs, which he did last week. Seattle RB's: This backfield might be the messiest in the NFL right now, with six running backs all seeing snaps. Converted wideout J.D. McKissic was the guy last week, finishing as an RB7 with 17 fantasy points, including a receiving touchdown. It's likely McKissic remains the top receiving back as C.J. Prosise sat out Thursday's practice. Thomas Rawls and Eddie Lacy are likely to split carries in some fashion, but nobody can be certain of how that will shake out. The uncertainty is frustrating because the Rams have been absolutely gashed by running backs so far this season, giving up a league-worst 31 point per game at the position. This might be the one time it makes sense to roll the dice with a Seattle back. Los Angeles Rams RB's: It's the Todd Gurley show once again. Gurley has cracked 20+ carries and 100+ yards in each of his last two games. He's the No. 1 running back in fantasy points through four games in standard and PPR. You start him in all leagues. If you're splitting hairs in Daily Fantasy, he's playing a Seattle team that's given up two 100-yard games to RB1's so far this season. Baltimore RB's: Alex Collins has emerged as the top back in this offense with Javorius Allen struggling. Alex Collins has been very efficient in his last two starts, rushing for over 160 yards on just 18 carries. He's only a flex option as of now, but could morph into an RB2 if he starts finding the end zone and sees more volume. With 18 targets over the last three games, Allen is still the favorite in the passing game. However, Collins did see two targets last week and could see more going forward. Oakland has been hit-or-miss against the run this year, making Collins risky but still worth a shot as a flex in deeper leagues. Oakland RB's: Oakland's backfield has steadily become more atrocious each week. Oakland's offensive line is getting 2.24 yards blocked per contact, so they're not the problem. Veteran Marshawn Lynch hasn't cracked 20+ rushing yards since Week 2 and looks washed after sitting out the last season. Jalen Richard and DeAndre Washington are talented but haven't been utilized fully yet. That could change with Lynch's recent struggles, and Richard might see more carries since he's more of an insider runner than the pass-catching Washington. Still, it's a tough matchup against a Ravens defense that struggled against Le'Veon Bell but has been dominant against all the other backs they've played. Green Bay RB's: With Ty Montgomery listed as doubtful for Week 5, so expect the Packers to use Aaron Jones and pass a lot against Dallas. Since Jones is a rookie and is still earning the trust of coaches, he likely won't see the volume Montgomery has been getting. Dallas is struggling against the run, giving up 27 points to the running back which is 4th worst in the league. Still, the Packers have several ways to beat teams, and will likely use Aaron Rodgers and the pass more which will curb any value to the running back minus a touchdown reception out of the backfield. Best to steer clear of these running backs this week. Dallas RB's: Minus the one dud against Denver, Ezekiell Elliott has been as consistent as they come for fantasy backs this season. He has 20+ carries in three games and a rushing touchdown in his last two. He's averaging five targets per game and has finished as an RB8, RB50, RB11, and RB3. This game has great gamescript potential for Elliott, as he's scored 42 of his 57.5 fantasy points when the Cowboys have a close lead or are tied. With plenty of high-scoring potential here, Elliott is a must-start in cash games for DFS and an obvious start in all other formats. Kansas City RB's: Kareem Hunt's volume keeps growing, as he saw a season-high 50 snaps in Week 4. You have to wonder when Hunt's role will start to wear him down though. He looked exhausted at times during the team's close win over Washington but still recorded his third 100-yard performance in four games. Hunt's been an absolute stud but Houston's defense has been locked in these past three games, holding each team's RB1 to under 40 rush yards. Hunt's nearly matchup proof given his role in the receiving game with 13 targets over four games. Still, this will be his toughest test yet on an undefeated Kansas City team that's getting a bigger target on its back each week. It's best to fade Hunt this week in DFS. Houston RB's: It's weird to think Lamar Miller is actually an RB1 this year but he is. He's finished as an RB17, RB21, RB35 and RB4 through four games, averaging out to an RB12. His volume has been consistent, hovering around 16 rushing attempts per game. The Texans rank third in plays per game with 69 which has also helped Miller stay on the field. He also benefited from rookie DeShaun Watson's blowup game last week, as he caught four of five targets for 56 yards and a touchdown. Kansas City is a very good run defense, allowing just one rushing score over their last three games. Miller has a low ceiling this week, but his floor is very reliable. Minnesota RB's: Rookie Dalvin Cook saw his promising rookie year come to an end last week, so now it's up to Latavius Murray and Jerrick McKinnon to pick up the slack. Murray will have the benefit of playing behind an offensive line that's getting 1.94 yards per contact blocked per game, but he's playing against a Bears front seven that hasn't allowed a 100-yard rusher all season. Murray's health is also in flux as he's still dealing with the same ankle injury that kept him from starting Week 1. McKinnon should inherit more targets with Cook out, making him a good add in PPR leagues. Still, this is a backfield you should stay away from starting until the picture comes into focus. Chicago RB's: Tarik Cohen was a dominant pass catcher in the first two weeks but he's since been out-targeted by Jordan Howard 9:8. Howard has rushed for over 190 yards and three touchdowns over his last two starts. He's the clear top option while Cohen's value is dropping off a little bit. Minnesota is one of the best run defenses in the league right now, allowing just 15 points to the running back position. Best to start Howard and fade Cohen. Stop guessing and start winning. Numberfire.com. Use the promo code 'FFHelpers' and receive your first month subscription for $9.99. This is Week 4 of this list. You can expect more data as the season goes along and trends emerge. Also, be sure to check out our weekly rankings for complete rankings at every position for Week 4. Week 3 was weird. Several surefire players ended up tanking, including Jay Ajayi and Marshawn Lynch. But while the NFL may seem unpredictable right now, keep in mind these are the often the times when things swing back to reality. For example, Ajayi is still going to get a ton of volume and be a menace going forward. Marshawn Lynch might lack a high ceiling but he's just being preserved so Oakland can use him when they need to cement a playoff spot down the stretch. LeSean McCoy should still be fired up this week, as he plays the running-back-friendly New Orleans Saints in Week 4. Overall, we're all tested when it comes to questioning our previously held fantasy football beliefs as the new season wears on. All the data we've accumulated in the offseason starts to become useless by about Week 4-5. So prepare to have your previous notions eradicated. But for now, hang on to them for at least another week or so. Here's a look at every fantasy relevant running back for Week 4. Game script: Pass heavy if New Orleans gets out to early lead. New Orleans RB's: It's looking more and like Mark Ingram is the back to own in this offense and Alvin Kamara is the PPR guy. Adrian Peterson continues to make a minimal impact with just 8 fantasy points through 3 games, with Ingram and Kamara scoring 23 and 19, respectively. The biggest surprise is that Ingram and Peterson's carry totals are similar, but Peterson hasn't made the most of his touches with just 3.3 yards per carry. Miami is an above average run defense, allowing just 19.3 fantasy points per game. Still, Melvin Gordon caught seven passes against them and the Ingram/Kamara combo has been good for about ten targets between the two. They're both solid starts this week with the high over/under. Miami RB's: Per Rich Hribar on Rotoworld, the Saints are one of two teams (Seattle) to allow a Top-12 scoring running back in each week of the season so far. This means Jay Ajayi should be in play as a rebound candidate after he struggled against The New York Jets in Week 3. There are elements of Ajayi's dud performance you just can't predict — sometimes one team shows up and the other doesn't. However, his lack of volume in the second half can be blamed on the game script. Not all coaches opt to go pass-heavy when their team is down, but Adam Gase does. Overall, the Dolphins threw the ball over 70 percent of the time and New York dominated the time of possession 36:23. Ajayi should see better volume against New Orleans in Week 4 given the Saints rank worst against running backs, allowing 33 points per game. Jacksonville RB's: Leonard Fournette has scored a touchdown in each game so far this season and ranks sixth in standard scoring. The gamescript was funky last week with Baltimore's stellar defense coming out flat in London, so don't worry much about Tommy Bahanon and Corey Grant taking snaps away or anything. Fournette is also averaging four targets per game. Game script should favor Fournette seeing heavy volume as long as the Jets don't get completely blown out. The Jets turned Jay Ajayi into Jay Acai berries last week, but they were dominated by LeSean McCoy and the Oakland's committee backfield in the first two weeks. Fournette is still a solid play this week. New York Jets RB's: People love Bilal Powell this week but I'm in the minority. Josh McCown hasn't thrown past 250 yards in a game this season which limits receiving upside in the backfield. Powell is averaging just 3.2 yards per carry. Jacksonville is a dominant run defense, allowing just 16 points per game against running backs this season. Elijah McGuire has seen increased snaps each week as well, and is expected to be 'involved' this week. Cincinnati RB's: The Bengals appear ready to feature Mixon as their true lead back going forward. After seeing just 16 snaps a week ago, Mixon saw 34 against Green Bay. He finished with a season-high 18 carries for 62 yards to along with three catches for 39 yards on three targets. Cleveland is an average run defense, but will have No. 1 pick Myles Garrett in the lineup for the first time. Still, we don't know how much they'll use Garrett and even if he'll be effective in his first game. The Bengals offensive line is struggling already, averaging just .71 yards before contact to running backs per Pro Football Focus. Despite that, Mixon should get enough volume to at least have a shot at decent numbers. Cleveland RB's: Vontaze Burfict has been activated for Week 4 and should help in an already decent run defense. Duke Johnson is starting to see a bigger role in the Cleveland backfield. His target numbers have increased each week. He also has two more total snaps than Isaiah Crowell, a back who's yet to score a touchdown or run for more than 45 yards in a game. Johnson ranks third in reception yards with 160 and is fourth in snaps per route with Le'Veon Bell. He's recorded at least 50 receiving yards in his last two games and could be a great darkhorse play if Cleveland starts giving him more volume in the run game. He's also a great PPR option each week as always. Pittsburgh RB's: Le'Veon Bell is still the clear starter. Bell hasn't created yardage by himself like he has in the past, as he just ranks 23rd in elusive rating among running backs according to Pro Football Focus. He continues to be effective none the less, ranking 15th in standard scoring among running backs even though he hasn't really had a dominant performance. Baltimore handled the Bengals and Browns running backs during their first two games, but will be without one of their best run stoppers in Brandon Williams. This could be a breakout game for bell, as his target totals have been steady each game (6,4,7) and so have his reception totals (3, 4, 6). He might finally pop in Week 4. Baltimore RB's: Javorius Allen has been the top snap guy as of late. He also has 10 catches in his last two games. The gamescript could favor a pass-friendly day as the Steelers rank 11th in passing plays per game which will increase Allen's opportunity. The Steelers are also giving up 27 points to running backs per game, sixth worst in the league. Jordan Howard and Tarik Cohen put up big numbers in Week 3 and Allen could have a favorable gamescript if Pittsburgh gets out to an early lead. Game script: High-scoring. Pass heavy. Carolina RB's: Jonathan Stewart remains the feature back in the offense, but his rush attempts have dwindled from 18 to 12 from Weeks 1 to 3. New England is coming in averaging 33 points per game, second most behind the Los Angeles Rams. It's hard to see Stewart seeing significant volume in this game. Christian McCaffrey has become Cam Newton's favorite check down guy, as he leads all Panthers in targets with 23. New England has also been soft against quarterbacks so far, so this could be a good game to start Newton and McCaffrey as a stack in DFS and avoid Stewart. New England RB's: Mike Gillislee remains the best volume back, averaging 15 attempts per game but has been out-snapped by James White in every contest but Week 2 where they each had 30. It's looking like Gillislee's fantasy value will be touchdown dependent at times, but that's no problem since the Patriots are scoring so much. The Panthers are above average across the board in terms of fantasy points allowed per game, and have been especially good against tight ends and quarterbacks. Still, they've given up 22 catches to running backs over three games. Gillislee and White are startable, but gameflow will likely hurt one of them. Los Angeles Rams RB's: Not a single back took a snap other than Todd Gurley last week and for good reason. Gurley is now the second highest scoring fantasy back through 3 weeks, trailing only Kareem Hunt. The Rams offense has also been potent, scoring 40+ in two of three games. What a difference Sean McVay has made already. The Cowboys haven't played a running back of Gurley's caliber yet this season aside from maybe C.J. Anderson of the Broncos in Week 2. Anderson finished that game with over 100 yards rushing and two total touchdowns. Dallas RB's: Ezekiel Elliott and the running game rebounded after getting throttled by Denver in Week 2. Elliott is one of the best volume backs in the league, ranking fourth in carries with 55. With just one rushing touchdown so far, you have to worry about Dak Prescott's read-option taking away scoring opportunities as teams key in on Elliott. Still, this is another great matchup for Elliott as the Rams are giving up 29 fantasy points per game to running backs, fourth worst in the league. Elliott continues to see a receiving role as well, averaging four catches per game. Detroit RB's: Ameer Abdullah and Theo Riddick are seeing an equal amount of snaps from week to week but Abdullah has a sizeable advantage in the touches category. Still, Riddick has out-targeted Abdullah 19-7 through three games. It's frustrating because Abdullah could easily be the receiving and rushing back, but Detroit continues to use Riddick. Minnesota is the best team against opposing running backs so far this season, allowing just 13.2 points per game. Minnesota RB's: Dalvin Cook's volume so far is surprising considering the Vikings spent money on Latavius Murray in the offseason and Jerrick McKinnon was supposedly the passing down back. Cook ranks second in the league in carries with 61, trailing only Gurley. While McKinnon is still getting targets, last week he saw his fewest of the season (2) and Cook saw five. There's a chance Cook could be used more in the passing game going forward. Detroit is also not a great rushing defense, allowing 25.7 fantasy points to running backs per game. Tennessee RB's: Don't be fooled by DeMarco Murray's 100-plus yard stat line, Derrick Henry is still a valuable piece in this offense. Murray ended up with 14 carries for 115 yards but Henry also saw 13 touches of his own. This is a tough matchup for both running backs, as Houston is giving up 16.7 points per game to running backs, which is 23rd worst. Houston RB's: Lamar Miller is still the every-down back but D'Onta Foreman is slowly entering the picture. Foreman's three targets led all running backs last week, and turned two of them into 65 receiving yards. Foreman is worth monitoring going forward, but he's still a risky start as of now since the volume isn't quite there. Unless you see coaches clamoring to get him more involved, avoid him in this matchup. Game script: High-scoring. Atlanta ranks fifth in touchdowns per game, meaning Buffalo might have to play catch up. This game will really come down to how well Buffalo's defense plays. Atlanta has had their way on offense with every defense so far, but they haven't played a group as good as Buffalo yet. Buffalo RB's: Buffalo is a run heavy team, rushing 32 times per game on average, which ranks fourth in the league. LeSean McCoy slogged through tough matchups with Denver and Carolina, scoring just 11 fantasy points in that time. He gets a dream matchup this week against Atlanta, a team that's given up 30.6 points to running backs, third worst in the league. While McCoy is the back to start this week, Mike Tolbert is also seeing decent volume as well. Tolbert has seen 10+ carries in two of three games and is known to snag a goal line touchdown from time to time. He's a risky play in DFS tournaments, but not a bad option considering how good the matchup is. If he gets a touchdown and 40 rushing yards (a feat he accomplished last week), he'll 3x his draft value. Atlanta RB's: Devonta Freeman continues to see plenty of carries and has at least one rushing touchdown in each game. People really want to be contrarian and take Tevin Coleman for a better value, and this might be the matchup to do it. Buffalo is giving up just just 15.7 points to running backs, good for 31st in the league. Buffalo has the speed on defense to keep Freeman in check on a consistent basis, making it likely Coleman might have to break the game open with a big run. If you think Buffalo will dominant this game on defense and Atlanta opts for a change of pace, then go with Coleman. Coleman also leads all running backs in targets with 13. Game script: Mid-level scoring. Favors Tampa Bay defense. New York RB's: Shane Vereen is an intriguing option this week, mainly because Tampa has struggled against pass-catching running backs. They surrendered eight catches to Tarik Cohen and five catches to Dalvin Cook. Plus, this is a desperation game for New York being 0-3, they'll be playing hard. Tampa Bay RB's: Jacquizz Rodgers gets his last go-around before Doug Martin returns from suspension. He and Charles Sims split snaps last week, and neither made a huge fantasy impact against a tough group in Minnesota. The Giants are better against the pass than the run at this point, but starting Rodgers is a risk considering he lacks a role in the pass game (zero targets through two games). Philadelphia RB's: LeGarrette Blount ran with purpose for the first time all season and finished as an RB14 with 13 fantasy points. He's dealt a tough matchup against San Diego, a team that ranks near the Top 5 in fantasy points allowed for running backs. The opportunity is still there though, as Philadelphia is tied for first in plays run per game with 69. Wendall Smallwood is an intriguing option as well this week. Taking over for Darren Sproles, Smallwood saw 43 snaps last week and should inherit anywhere between 4-8 targets and 5-10 carries. Los Angeles Chargers RB's: Melvin Gordon and Branden Oliver both saw 33 snaps last week. Gordon is dealing with a bone bruise but all reports indicate he will play against Philadelphia. He's still the clear-cut No. 1 back, but Oliver saw six targets last week and turned them into four receptions for 18 yards. It's not out of the question could see a similar workload in Week 4. Plus, with Pro Bowl defensive tackle Fletcher Cox battling a calf injury, we could see an easier matchup for Gordon and Oliver. Game script: Run-heavy, defensive game. San Francisco RB's: Carlos Hyde is one of the top fantasy running backs in the NFL right now. He's a bit banged up with a hip injury and is 50/50 to play on Sunday, but he's still very valuable if he does suit up. Matt Breida would be the next guy up, and has only carried the ball 11 times through three games. At 5'11, 190 lbs, the rookie Breida was a standout runner at Georgia Southern but a poor 2016 season hurt his draft stock. Still, he could be an impact player given his straight-line speed (4.3 40-yard dash) and he's one of the more interesting backup running backs in the league overall. He's made a small dent in the passing game, ranking second among San Francisco RB's in targets with 6. Arizona has given up a rushing touchdown to RB1's in each of the last two games. Keep an eye on Hyde's status heading into Sunday. Arizona RB's: The news that guard Mike Iupati would play Sunday were dashed late Friday as four-time Pro Bowler was sent to injured reserve, likely ending his season. The matchup is still decent for Chris Johnson though, as the 49ers are surrendering 27 points per game to running backs so far. Johnson's ceiling is curbed by Andre Ellington's role in the receiving game, as Ellington saw eight targets to Johnson's two. Ellington's receiving role was heavily influenced by gamescript against Dallas and although the 49ers are still a bad team overall, their offense put up 39 points a week ago. It's tough to start either of these backs this week. Oakland RB's: Oakland's running backs managed a measly 22 yards rushing last week against Washington. Their matchup doesn't get much easier as they play a Denver team giving up just 16 points to running backs. They have nowhere to go but up though, and Marshawn Lynch should continue to see the most volume with Jalen Richard also mixed in. DeAndre Washington saw a season-high six targets last week due to gamescript, and it's tough to trust him or any other Oakland back in this matchup. Denver RB's: C.J. Anderson and Jamaal Charles are now the one-two punch in this offense. Charles outscored Anderson for the first time last week with 12 fantasy points and finished as an RB15. Anderson still out-snapped Charles 49-21, but the veteran back isn't going away anytime soon as he continues to make the most of his carries. Oakland is middle of the road against the run, making this a bland matchup with modest potential for both Bronco running backs. Indianapolis RB's: Seattle isn't the dominant run-stopping defense it once was. They've allowed at least a 100 yards or a touchdown to RB1's in the first three weeks of the season. With Marlon Mack out this week, Frank Gore has some dark horse potential coming off a 57-yard performance with a touchdown last week against Cleveland. Only issue is it took Gore 25 carries to do it, and he'll need that kind of volume again if he's expected to turn in a similar performance. Overall, Gore is a better option for cash DFS tournaments or deep redraft leagues due to a low ceiling. Seattle RB's: Chris Carson is now the feature back in Seattle and C.J. Prosise the pass catcher. Prosise is doubtful this week, making Carson an interesting RB2 with upside. If Carson was going to go over 100 yards this season, this would be the matchup to do it. Washington RB's: Chris Thompson's six-catch, 150-yard performance last week was sensational, but Kansas City will be his toughest task yet if he's expecting to continue his crazy efficiency numbers. Robert Kelley has been practicing this week and could assume the inside runner role due to rookie Samaje Perine's struggles. Overall, Thompson is the only fantasy relevant back in this offense as of now, and his efficiency numbers are bound to fall off at some point. Kansas City is surrendering 23 points per game to running backs this season. Kansas City RB's: Kareem Hunt is the best running back in fantasy by a wide margin, and gets a Washington defense that's surrendered 18 receptions to running backs over three games. Although Washington showed up against Oakland last week, Kansas City's offensive line is on another level and Hunt is locked in as an RB1 once again. Our site's number one goal is simple — to give you valuable fantasy football advice in an entertaining way. Our other important goal is to get your grandma to learn how to use the internet and start her own fantasy football team. So many fantasy football websites are stat-based and don't stress the ultimate purpose of playing fantasy football — which is to have a good time with your friends/family.